The End is Nigh….I can feel it getting closer, so I am wrapping myself in a bubble of unreality so I don’t have to think about it…..
Luckily I am busy enough…so not much time for retrospectives. What happened today? 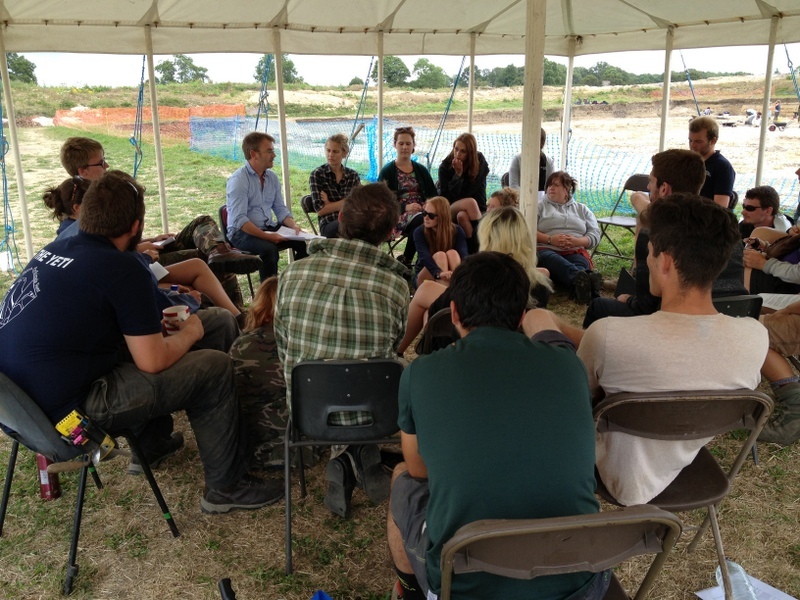 Lots of organising of the week ahead: on site lectures and sign-ups sessions; volunteers needed for our FINAL Open Day (fabulous champagne prizes offered by Silchester participant and Reading student Richard Bond – thank you Richard! Bubbles much appreciated!)….. I was filmed on site by Andrew Munson for his Calleva documentary……not a day for close-ups as the wind whipped my hair into an ice-cream cone shape…..
Dave Thornley and Stuart Black visited from Reading’s Department to look at our in situ ceramic building material in Insula III, with a view to dating selected pieces using a method which measures the rehydration of the selected pieces over time…. And finally Ben Ford came to visit! Ben is Senior Project Manager with Oxford Archaeology, and a Reading and Silchester graduate to boot. Ben was on a recruitment drive: commercial archaeology is entering a boom alongside the construction industry as we emerge from the recession…and there are jobs out there for our graduates! 12 of my Silchester staff are interested in working for Oxford Archaeology, and Ben walked away with a pile of applications….